Paulist Fr. Rich Andre prepared this homily on the Feast of the Baptism of the Lord (Year C) on January 13, 2019, at St. Austin Parish in Austin, TX. The homily is based on the day’s readings: Isaiah 42:1-4, 6-7; Psalm 29 or 104; Acts 10:34-38; and Luke 3:15-16, 21-22. Today is the last day of the Christmas season, as our gospel passage opens with the last moment before Jesus begins his public ministry – roughly 30 years after his birth. But it’s also the first day of Ordinary Time. Why is that? Because our passage is about the event that begins Jesus’ public ministry. On this Feast of the Baptism of the Lord, let us remember that we have all been baptized into Christ’s baptism. Therefore, when the first and second readings speak of Jesus setting prisoners free and Jesus healing the oppressed, let us hear those as mandates for what we must do as members of the Body of Christ! Once again, let us celebrate that we continue to receive God’s mercy, and that we are called to continually share that mercy with others. I have a really annoying habit as a priest and an extreme extravert. When someone else is giving a presentation at church, I always want to jump in with my two cents. And usually, I don’t stop at two cents. If the whole presentation is worth a dollar, I want to put in at least sixty cents! Back when I led RCIA, the night that it was the biggest challenge for me to keep my mouth shut was when someone else on the team was designated to talk about sacraments in general and baptism in particular. I love talking about sacraments! 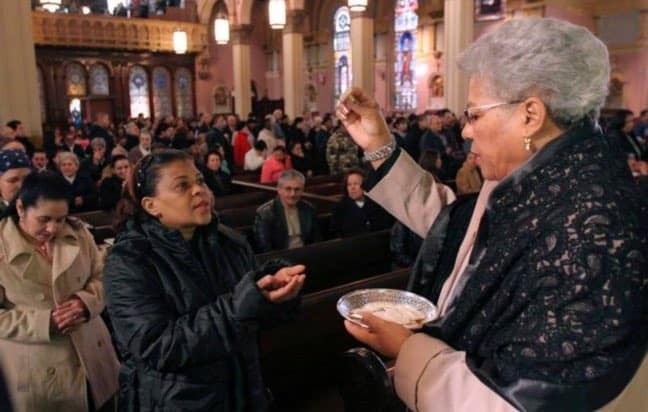 Catholics of a certain age learned by rote what a sacrament is from the Baltimore Catechism: “A sacrament is an outward sign instituted by Christ to give grace.” That’s a good start, but there’s so much more to say! Whenever I wrote papers in the seminary on sacraments, I tried to work in the word “multivalent.” There are so many layers to sacraments. We will never completely comprehend their mysteries in this lifetime! There’s always more to contemplate and celebrate. When we talk about the Baptism of the Lord, someone usually asks, “If Jesus was born without original sin, why did he need to be baptized?” Well, baptism should not be primarily understood as a ‘get out of hell free’ card.” When we introduce adults who are preparing for baptism to the parish assembly, we ask them, “What do you ask of God’s Church?” I’ve never heard anyone respond with “cleansing from original sin.” They talk about belonging, community, and following Christ. They recognize that a relationship with God somehow involves all the rest of us, too. When we baptize infants, it is our hope that the parents want their child to belong in the Christian community as they grow up. Baptism is our initial entry into the Body of Christ. It’s the moment we become members of that Body. It is the beginning. Our neighbors may ask why we baptize infants instead of waiting until the children are old enough to make a decision for themselves about being Christian disciples. But why should people have to reach some threshold of rational thought before becoming members of the Body of Christ? We don’t wait for children to decide to become CPAs before we teach them their numbers. We don’t wait for them to decide to write the next great American novel before we teach them their letters. So, why would we wait to teach them about faith? You can explain the basics of Christmas to a three-year-old! Sacraments are public, communal events. That’s why we prefer to have children baptized at Mass, not in a private ceremony afterwards. Even though logistics force us to stand in line to receive communion and even though we make our confessions in private, these are not supposed to be private moments between “me and Jesus.” In every sacrament, we affirm our commitment to Christ through our commitment to one another, the other members of the Body of Christ. If we think of any of the sacraments merely in terms of what we receive from it, we’re missing the essence of what it empowers us to give to one another. This year – as we work out way through the Gospel of Luke with so many stories of forgiveness and so many references to the Holy Spirit – let us be challenged to see mercy in the same light as the sacraments. It’s not only supposed to be about what we receive through God’s mercy; it’s also supposed to be about our obligation to share that mercy with all other people. As the voice spoke from heaven at Jesus’ baptism, we hear that same message spoken to us, today, in the early days of 2019. Dear friends, we are God’s beloved sons and daughters, with whom God is well pleased. The work of Christmas has begun. Holy Spirit, let’s get to work!